Several parcels of the Sunset Hills Golf Course property have been donated to the city of Sunset Hills. Sunset Hills officials are both excited and challenged by the prospect of how best to use 120 acres of open space that once was the Sunset Hills Golf Course at 13360 W. Watson Road. They kicked around some ideas generated by the parks committee in addition to a proposal from the St. Louis Bombers national rugby club at an Oct. 23 special meeting. Steven Bander, owner of B Golf LLC, donated the property, which lies partially within a flood plain, to the city in September. It has operated as a mid-priced 18 hole golf course since 1989, and is the home course to several area high school golf teams. The city finalizes acceptance of the property on Dec. 1. 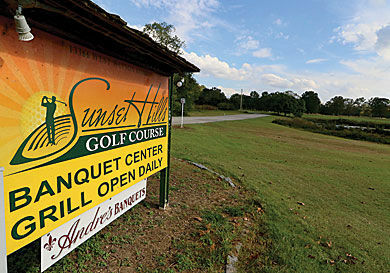 The last day it will be open as Sunset Hills Golf Course will be Nov. 15. Before Parks and Recreation Director Gerald Brown presented a report on some early ideas the committee had discussed, the board of aldermen heard a proposal from St. Louis Bombers founding member Ron Laszewski, who also coaches the men's rugby team at Lindenwood University. The rugby club is eyeing 12 acres in the southeast corner of the city tract as a possible location for three or four rugby fields (known as "pitches" in rugby-speak) bleachers, pavilions, restrooms and concession areas. "Rugby is the fastest-growing sport in America, with 30 million followers and growing," said Laszewski. "Ten area high schools have rugby teams and five universities in the area have teams." Laszewski said locating a rugby complex in Sunset Hills would put the city on the map as Fenton's soccer park has done for that community. "It would be the premiere rugby location within 1,000 miles and would draw national and international competition," Laszewski said. All development and construction associated with the proposed complex would be underwritten by the Bombers Club. Alderman Kurt Krueger noted dubiously that "this would a private club, but on public land?" Laszewski said such arrangements are not unprecedented. The board consensus was that the Bombers' proposal was interesting and would be considered among the city's numerous options for developing the former golf course property. • Radio-controlled recreation device course. Three aldermen who expressed their opinions all said they oppose the city operating the land as a golf course. "No way, a golf course is too expensive," said Dee Baebler. Thompson Price said golf courses are struggling, and the community already has the Tapawingo National Golf Club right across the street. Mark Columbo said he is not "a big fan of municipalities competing against private industry." No decisions were made but Brown was directed to further explore options outlined, including a public survey, possibly funded by a grant.